Hello my friends! You may have noticed posting here lately has been a bit sporadic and it will continue to be so. Nothing bad going on, only super busy at work and home and my free time and brainpower are not linking up very well. Plus I have a bunch of books I am trying to read and I feel as though I am not getting anywhere except closer to their library due dates. So when I do start to manage to post regularly again, I hope I will have lots of books to tell you about. Today, however, I must tell you the Dashwoods celebrated their Hatch Day on Thursday. They are officially one year old now. It has been a wonderful year with them, learning how to care for them and getting to know them. Bookman and I both marvel nearly every time we see them out in the garden. 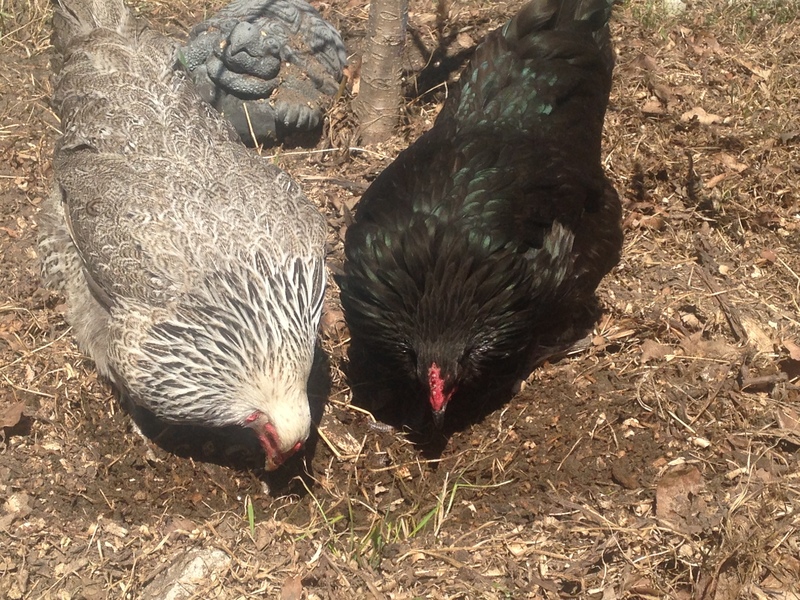 We look at each other and exclaim in surprise, We have chickens! Initially Bookman did not want to get chickens. I suggested that maybe sometime we might want to and he did not hesitate to say absolutely not. But I kept working at him and casually mentioning it and then several months later I took a chicken keeping class just to find out about what would be involved. And I spent the spring and early summer talking about it until finally Bookman gave in. We started building the coop in the fall, got the framing up and then had to call off the work for winter. This time last year as we had baby Dashwoods peeping and growing under a heat lamp in our basement, we were frantically spending out spare hours finishing the building of the coop and run. We did it and the coop and the Dashwoods survived their first year with only a few mishaps along the way. To celebrate their birthday, they got an extra large purple cabbage. It was so large they haven’t managed to finish it yet despite their best efforts. Of course they have also been busy in the garden especially yesterday when we had a beautiful sunny day and temperatures reached 64F /18 C.
have joined us. I love watching them. I love sitting in the sun in the garden and talking with them and having them talk back. They make us laugh when they come up to the glass deck door and look in. Their voraciousness is both funny and alarming. They get so excited to see us in the morning and after work. And they do not hesitate to scold us when they are mad about something. It has been a fun year of adventures with them and I look forward to what year two will bring. Yesterday was such a gorgeous day I had to get out and do some garden work even though I had a virtual bike race and rode another three hours afterwards. Spring waits for no one. 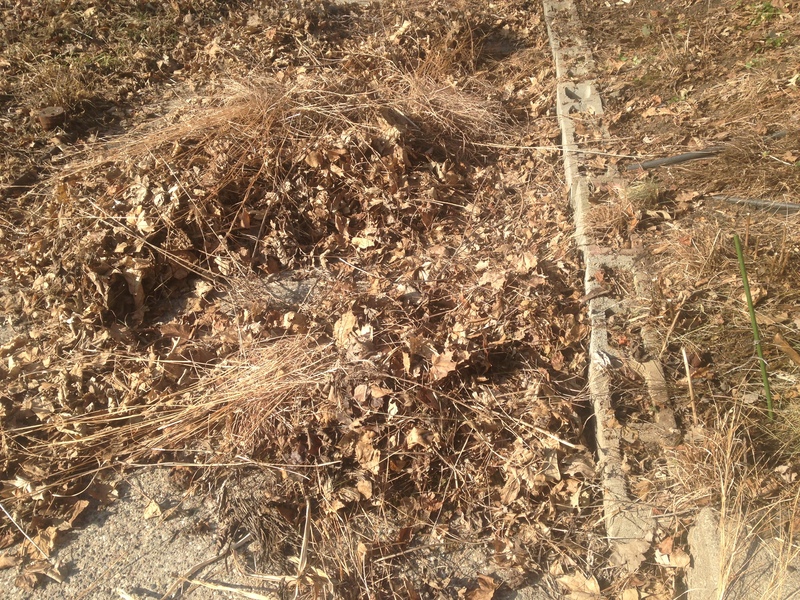 Earlier in the week Bookman had time to pull the leaf mulch off one flowerbed and I finished the job doing two on Saturday and two more today even though today is not nearly as nice as yesterday. Spring arrived early here but the warm up has been slow. Yes, we’ve had some especially warm spring days but then temperatures drop back to mostly above freezing but still chilly. This means everything has been slow to start growing. Usually we are cold and then wham! it’s spring and warm and sunny day after day and things start growing and we are running around like crazy to get the mulch off the beds and when we finally do, the tulips are a little sad and bleached looking (they quickly recover). This year, the spring bulbs are just poking up and have not had a chance to grow much or be bleached from lack of sunlight. For once I almost feel on top of things! The trees are starting to bloom, the grass is greening up, and the garden berry bushes are unfurling a few tiny leaves to test the situation. It’s all very exciting because this time of year, every day the world looks a little different than it did the day before. All of the seeds we started indoors are doing magnificently. Well, all but the eggplant. Only one seed sprouted and it isn’t looking that strong. There might not be any small orange eggplants this year unless the one sprout manages to pull off a miracle at this point. There’s always next year to try again. In about two weeks I’ll be able to plant peas and other cool weather vegetables like beets, lettuce and kale. So excited! But still so much work to do to get ready including Dashwood-proofing the garden. In cycling news, April is 30 Days of Biking. I might not bike outdoors every day, but I mean to be on a bike every day. Monday will see me riding outside for the first time this year as I plan to begin bike commuting to work. I am terrified of the traffic in downtown Minneapolis even though there are many well-defined bike lanes, but I have, I think, worked out a pretty good route that, while it takes me on a less direct way, will, I hope, get me there safer and less stressed out over cars. One of my coworkers will also be biking to work tomorrow. Sadly, we don’t have the same schedule nor do our routes conveniently merge. If they did, it would be a blast to ride in to work together. 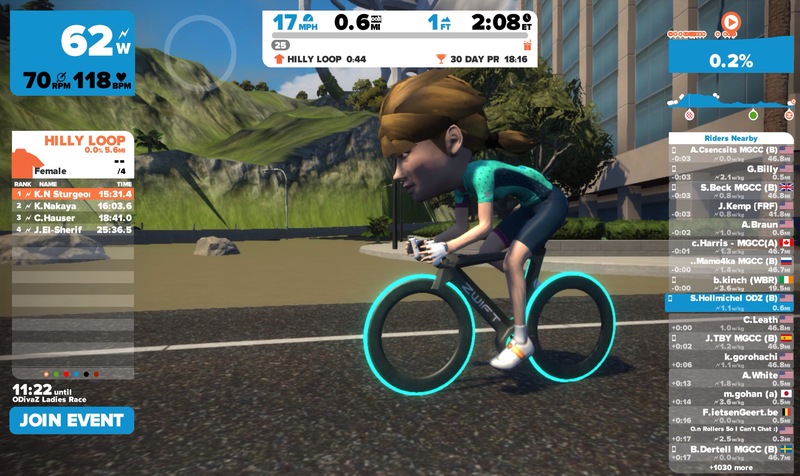 Zwift had some April Fools Day fun yesterday by turning everyone’s avatar into bobbleheads. It was hilarious but also made racing more difficult because everyone’s big heads kept getting in the way and I couldn’t see where I was or who was around me. Even the race commentators were having a hard time but it was all in good fun. It’s the surprise of bobblehead avatars that help make Zwift so enjoyable. In sad cycling news, Mike Hall, one of the world’s best ultra-endurance cyclists was hit by a car and killed a few days ago. He was competing in an inaugural coast-to-coast race in Australia. At the time he was in second place and had tweeted earlier to alert other riders that traffic on Monaro Highway was dangerous and had a tendency to pass fast and much too close for comfort. If you have seen the documentary Inspired to Ride, you will know who Mike Hall is. He was only 35 and one of those all-around nice people whom everybody loved, kind and generous, and without ego and airs in spite of being a top cyclist. In the world of ultra-cycling, a good many riders also raise money for charities, Mike was no exception. He died at the scene of the accident. The remainder of the race was cancelled. There was a tribute ride for Hall in Sydney on Sunday and someone on Zwift organized a tribute ride yesterday. Please, if you are a driver, look out for cyclists. Yes, I know, sometimes they can be real asses, but most of us are not like that. Yeah we make stupid moves sometimes, just like you do, but most of us are terrified of you running us over because we are all too aware that in a collision between you in your car and us on our bikes, the car will win every single time. The road belongs to us too and we have just as much right to be there as you do. Please be alert. Please stop talking on your phone. Please stop texting. Please pass with at least a meter of space between you and the cyclist. Please don’t think passing really close and honking your horn is funny. It isn’t. Please don’t cut sharply in front of us to turn right or left. Please remember that between you and the bike, it’s the cyclist’s life on the line, not yours. That probably doesn’t make you want to hop on a bicycle and go for a ride. But the more people who ride bikes, the better. So get on your bike and ride! Happy birthday Dashwoods! And what sad news about the biker — I always try to be super careful of bikers, particularly if they don’t have helmets. Even if they are being idiots (which I am sure you are NOT), the relative ability of their bike and my car to do longterm damage is so disproportionate that it still behooves me to be extra careful. First and foremost, Happy Birthday, Dashwoods!!!!!!! My uncle Tom was an avid cyclist, who always followed the rules, wore a helmet and reflective clothing. He was struck and killed by a car one night and the woman driving had the gall to say she “thought she’d hit a turkey.” I think about that every time I am driving there is a cyclist ahead of me. I slow down, move to the side if I can, so I can pass with a wide enough berth to avoid hitting them. But it makes me so nervous. Deb, thanks! Oh, so sorry about your uncle! It breaks my heart that even cyclists who do everything right are still struck and killed. Thanks. It’s been a few years, but you know? I cannot get over that woman saying she “thought she hit a turkey.” How does anyone mistake a grown man, in bright reflective clothing, on a bike, for a turkey?!? I don’t even know. I can’t wrap my head around it, even after all this time. Yeah, It’s insulting and shows just how much she wasn’t paying attention. I hope she got some jail time, it doesn’t bring your uncle back, but it’s something. Sadly, no, she didn’t. Apparently, she was sympathetic enough that the jury called it an accident. Worse, she lives in the same town as my aunt and SHE acts like its an insult if they run into each other. And her family has protested uncle Tom’s ghost bike. OMG! So wrong in so many ways! I am not generally a violent person but wow, if I were your aunt I’d have a hard time not punching the woman in the face. And they even protested the ghost bike? Grrr! I know. Aunt Denise takes it with a lot more grace than I would, too. I suppose it would be different if the woman expressed remorse, at the very least. Regret. Some kind of acknowledgement that my aunt, her children and our family have every right to the grief. But no. Oh deb, hugs to your aunt and all the family. I think I might be joining a bike advocacy group, Gotta do something to make the streets safer for people who aren’t in cars. Happy Birthday, DAshwoods! we all love the chickens! thanks for sharing them with us–now we don’t need to get chickens of our own . . . I year old! 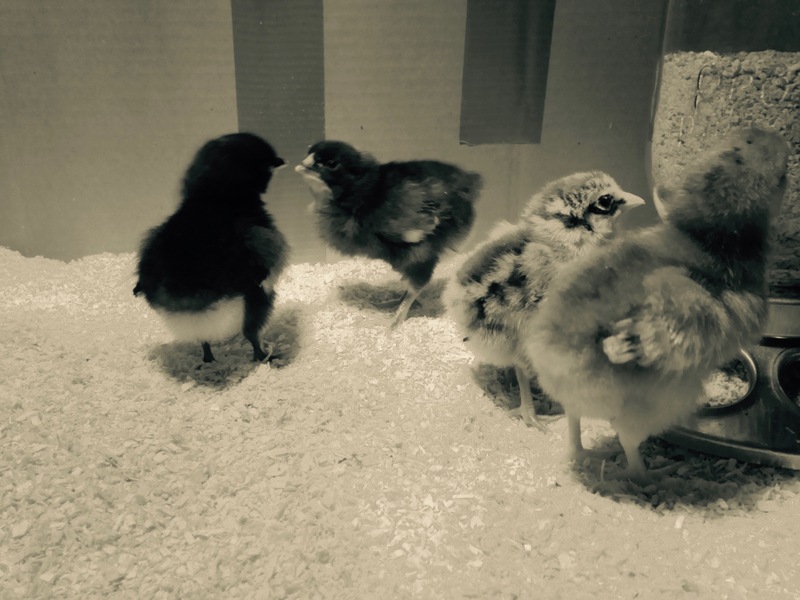 They’re past being called chicks, and just now passing being called pullets! Congratulations on one year of the Dashwoods- they have been a lot of fun to read about! Ian, glad you have enjoyed reading about them! A salutary reminder that all,road users have responsibility for safety. One thing that puzzles me is that cyclists are advised strongly to wear a helmet but there are few guidelines about lights. You can buy a bike now without any lights attached. So many toms when im driving I see the cyclist far too late for comfort because they are also wearing dark clothing. It’s surprising there isn’t any legislation requiring lighting…. BookerTalk, bikes are sold without lighting but they are all required to have reflectors in the US. In Minnesota, cyclists who ride in the dark are required to have lights both front and back, and more and more cyclists here are also using red rear lights during the day to increase visibility. Some of it is a matter of legislation and some of it a matter of culture and safety. We’ve got both happening here but cyclists are still hit by cars more often than is comfortable to think about. Happy Hatch Day to the Dashwoods! Thank you for sharing them with us. I’ve enjoyed their escapades. They’ve grown into beautiful hens. It’s so sad that biking has lost a young rider. I love this time of year, even if the signs of spring in the city aren’t as exciting as they are in the garden. We walked to the ‘nature park’ near us yesterday and saw ruddy ducks and tree swallows. The swallows weren’t there last week. We reveled in the sunshine and the birds. Joan, I am glad you have enjoyed the Dashwood escapes! They have been fun to share. It’s nice you have a nature park near you that you can go to. I saw a few robins two weeks ago and the duck arrived last week. The early morning bird chorus has also begun. I hope your swallows arrive soon, then you’ll know spring has come for sure! A very very Happy Birthday to Dashwoods! How time flies!!!! I hope they enjoyed their Birthday Cabbage. I am quite impressed with your “subtle’ influencing skills on Bookman! I read about Mike Hall as well and it is such a sad heartbreaking news! Sometimes it actually seems, those whom God love, die young! Hang in there! cirtnecce, they very much enjoyed their birthday cabbage as revealed by the purple packages they deposited all over the garden as a result 🙂 Heh, yeah, sometimes he just needs a little convincing 🙂 Heh, I’m not exactly young anymore, I will definitely be careful out on the roads! Oh, my. Found myself flashing back to the ancient 70s when our family tried to keep chickens in hopes of saving money on eggs. 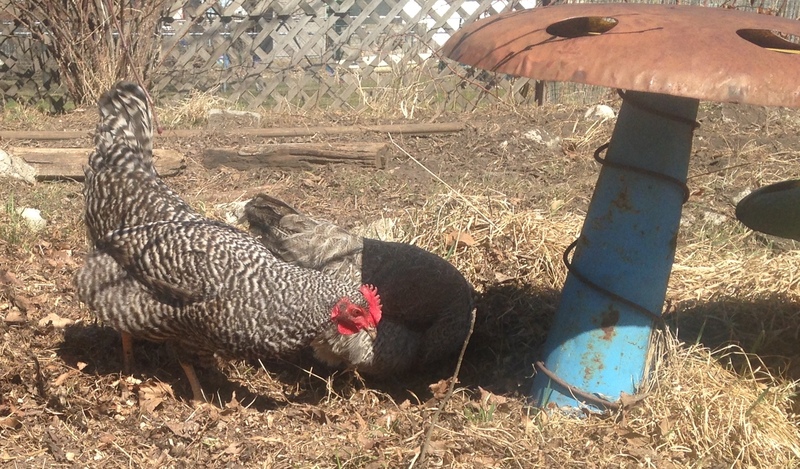 They were a surly bunch and we were spending more on their upkeep than we saved on eggs. My dad couldn’t bring himself to turn them into dinner, so we took a road trip to Moorpark, parents and children and, of course, chickens, where he drove as close as he could to Egg City (a very large egg farm) and released them to the wilds of the Moorpark hills. One hopes they eventually made their way, Watership Down-like, to a nice, chicken-friendly home, but now that I’m old and jaded, I suspect they didn’t. Cameron, heh, no chickens don’t really save one much money but they are lots of fun! Happy Hatch Day! I hope it’s not rude to ask but I wondered if you and Bookman eat the eggs? I know you’re vegan, but I also know these eggs are 100 per cent cruelty free thanks to your good offices, so maybe they are ok to eat? Enjoy riding outdoors! Thankfully there’s only a few days each year where it is totally impossible here and we cycle everywhere, it’s such a pleasure. I always choose the quietest roads too, no shame in that. As I tell my children, the person who can go fastest has to look out for the slower ones: cyclists look out for pedestrians, drivers look out for cyclists and pedestrians, van drivers look out for everyone. I just wish it were true! There are lots of interesting studies regarding the utility of helmets – there are even a few which seem to show that wearing them leads drivers to behave more recklessly around cyclists, which is pretty messed up if you ask me. Good luck with all the reading and working Stephanie, we’ll still be here! Maggie, oh no, not rude to ask at all! You are right, we are vegan but because they are laying eggs anyway and when they get too old to lay anymore they will not become dinner, and they are well cared for and not kept in tiny cages, and are 100% organic fed, yes, we do sometimes eat their eggs. We are so used to not eating eggs though that they are a weird thing we have now and then and we only seem to eat them scrambled or frittata style and they never get incorporated into anything else. 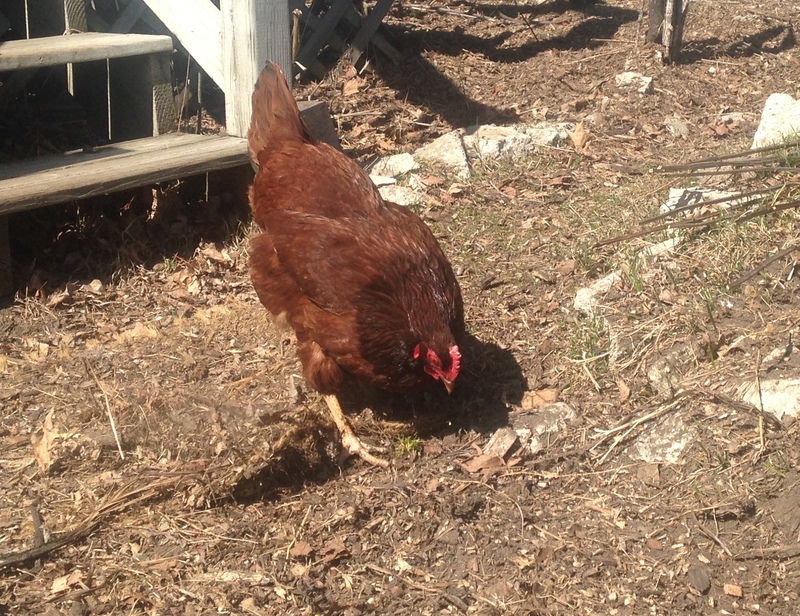 Most of the eggs get fed back to the Dashwoods or shared with friends and neighbors. No shame in choosing the quiet roads to cycle on! I started bike commuting to work and take a slightly longer route in order to ride on quieter roads. How fun that you cycle everywhere! And great lesson to teach your kids! How weird that drivers might be more reckless when cyclists are wearing helmets. What the heck?